A new cupcakery opens downtown. Plus, burgers in Mead. 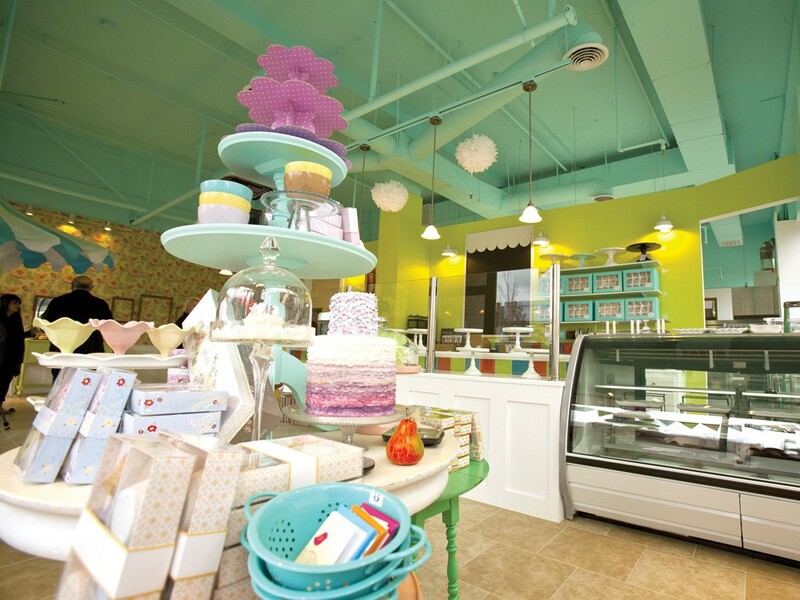 The cheery, colorful scene at Sweet Frostings. Everything about Sweet Frostings Blissful Bakeshop could be described with some sort of sugary adjective. Upon entering, I am immediately struck by how bright and cheery every detail of the store’s interior is. Its decor is as sweet as the baked goods that sit atop their cake stands — so much so that the display desserts had to be pointed out among the candy jars, recipe books and other whimsical items in the retail area. And Sweet Frostings’ owners, Sally Winfrey and Judy Rozier, are equally chirpy and impeccably dressed, despite spending the majority of their waking hours in their new kitchen preparing sweets. And what a team they make. Rozier, a retired former mortgage lender and self-proclaimed perfectionist, set her sights on baking a little over a year ago, when she brought home some cupcakes after a particularly difficult day. “After tasting them, I decided that I could do this myself, only better,” she says. Shortly thereafter, she enlisted the help of longtime friend Winfrey, who boasted 20 years of commercial baking experience. The deal was officially sealed after the duo filled in for a baker who canceled at the last Funky Junk Show. They sold 580 cupcakes in just two days. In addition to cupcakes, Sweet Frostings will sell morning pastries, such as muffins and cinnamon rolls, as well as whoopee pies, cheesecakes, French macarons, along with a few signature items — like cake truffles (also called cake pops) and homemade pop tarts. The flavors will be influenced by the season, so look out for winter-spiced and pumpkin-laced treats. Rozier also boasts that the duo’s gingerbread and ginger snaps are the definitive treat for ginger lovers, as they contain three different varieties of the spicy root. The gluten- and/or wheat-intolerant need not stare longingly through its windows, wistfully remembering their bygone days of baked-good enjoyment; these ladies have you covered. And because black coffee pairs perfectly with all things sweet, and DOMA will be the purveyor in this particular establishment. “This is just the beginning. Once we get everything down, we would like to expand, maybe have a shop on the north side or the Valley,” Rozier says. A sign on the door of the Mercury Grill professes that you won’t find mayo, lettuce or pickles on top of your burger at this establishment. Owner Scott Stead doesn’t want to ruin the flavor by putting that kind of garbage on it. Instead, Stead serves them how he and his family do at home — with heaps of coleslaw and barbecue sauce. “First they argue, then they try it,” Stead says of the customers who arrive at his restaurant in Mead. He got the idea from New York-style hot dogs, which are sometimes topped with slaw and barbecue. He thought that if it tasted good on a hot dog, he says, it could translate just as well to a burger. He was correct. “He’s turned crack addicts into burger addicts,” says Stead’s employee and nephew Zac Taylor. For a man with no restaurant experience, Taylor is getting a lot of things right at his two-month-old restaurant. His meats are from Spokane meat distributor Inland Meats, which is the only licensed distributor of certified Angus beef in the area. What his partnership with Inland Meats means for his customers is fresh, hand-formed patties that weren’t frozen and aren’t tough. They’re seasoned with nine different spices to give them Stead’s signature flavor, and when grilled and served, the juicy patty seems to fall apart on your tongue. His burgers ($3.50-$8.50) aren’t his only strong point, either. Stead also has his special teriyaki dish ($5.99-$8.99) and a host of hot dogs as well. But the real gems are on the dessert menu. Deep-fried Twinkies ($2.50) topped with chocolate sauce and whipped cream have rapidly become a popular menu item, as have his milkshakes made with real ice cream ($3.50). He also has a drive-thru coffee stand on the south side of the building that’s up and running every morning.